The Union of Myanmar, previously known as Burma, is the largest country in mainland Southeast Asia. A former British colony, Burma became an independent republic in January 1948 and democratic rule lasted until 1962. After a military coup d’état led by General Ne Win, the country was under miltary rule until the election of 2015 brought the first non-military leader to power. Htin Kyaw was elected president and a new position akin to prime minister was created for Nobel Laureate Aung San Suu Kyi. Today the Myanmar Jewish community consists of a small few families, but they are active and have a small local synagogue. 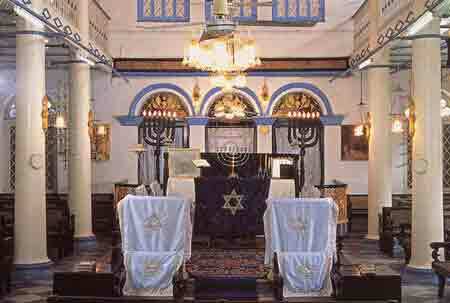 In recent years, the Yangon synagogue has hosted a Hannukah celebration attended by various Burmese government officials and other dignitaries. Jews from Calcutta, Cochin, and Persia may have settled in various towns of Burma in the first half of the 19th century. 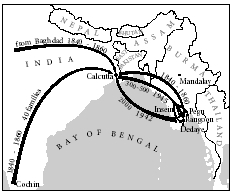 Specifically Baghdadis from Calcutta with business interests – often based on opium – further east would stop at Rangoon (modern day Yangon) on the way to Singapore, Jakarta, Manila and Shanghai. The first Jew known definitely to have settled in Burma was Solomon Gabirol, probably a, who served as commissar in King Alaungpaya’s army. A Jewish merchant, Goldenberg, from Romania, engaged in the teakwood trade and accumulated great wealth. Solomon Reineman of Galicia arrived in Rangoon, the capital of Burma, in 1851 as a supplier for the British army and opened stores in various places. His Masot Shelomo (“Solomon’s Travels,” 1884) contains a long chapter on Burma, and is the first Hebrew account of the country and its towns. Movement of Jews to and from Burma in the 19th and 20th centuries. Serious Jewish settlement in Burma didn’t begin until after the British conquered Rangoon in 1852. In 1857, Musmeah Yeshua Synagogue was established in Rangoon, first taking the form of a wooden structure and later in 1893–6 rebuilt in stone. A second synagogue, Beth El, was built in 1932. The Jewish community, scattered in several places in the country, particularly Mandalay (where there are still a few Jews), Bassein, Aykab, and Toungyi, included members of the group from Bombay, Arabic-speaking Jews from Calcutta, and Jews from Cochin and other parts of the Oriental Diaspora. With World War II and the Japanese invasion of Burma, community life was disrupted and many Jews fled to Calcutta or Ereẓ Israel after bombings of Rangoon began on December 24, 1941. After the war, about 500 Burmese Jews returned, but later they left the country. In 2010, only about 20 Jews remained in Yangon, although the Musmeah Yeshua was still maintained through the efforts of Moses Samuels, the patriarch of Yangon’s Jewish community since 1978. Burma became independent in January 1948 and therefore did not participate in the deliberations of the UN on the partition of Palestine. The specific Jewish aspect of the problem was completely alien to her and, like many Asian countries, she regarded the Jewish settlement in Palestine as a manifestation of “Western Colonialism.” Thus, in the spring of 1949, when Israel applied for membership in the UN, Burma cast a negative vote. However, following a seeming stabilization of the situation in the Middle East, in December 1949, Burma accorded full recognition to Israel. The first contacts between the two countries were created in the framework of the international labor movement. In 1952, a Burmese socialist mission visited Israel and additional contacts were developed when an Israel delegation, headed by the then foreign minister, Moshe Sharett, took part in the first Asian Socialist Congress in Rangoon in 1953. Shortly after, full diplomatic relations were established and Israel’s first minister to Burma, David Hacohen, opened a legation in Rangoon. The Burmese opened theirs in Israel in 1955. Until 1963, relations between the two countries developed swiftly. Prime Minister U Nu was the first leader to pay a state visit to Israel, doing so in 1955, shortly after the Bandung Conference, at which Burma unsuccessfully fought for Israel’s admittance to the caucus of Asian-African countries. A special agreement concluded in 1956 served as a framework for the constantly growing cooperation. Israel sent a large number of professional and agricultural experts to further Burmese projects. A model agricultural settlement was set up by Israeli experts in the northern dry zone (the “Namsang” project); a joint shipping line was built (the Burma Five Star Line); irrigation schemes were set in motion; nurses were trained; the Burma Pharmaceutical Industry (BPI) was provided with Israel technological assistance; a joint construction and contracting firm was established; and expert counselors co-managed important Burmese projects. This cooperation also extended to the Burmese army, the nucleus of whose parachute corps was Israeli-trained. Under a commercial contract, Israel imported substantial quantities of rice from Burma. A constant exchange of visits was made by leaders of both countries: the chiefs of staff paid almost annual visits; Israel’s president Ben-Zvi went to Burma in 1958, Prime Minister Ben-Gurion in 1961, Golda Meir, then foreign minister, in 1962. General Ne Win, who succeeded U Nu, also visited Israel. Both countries’ missions were raised to ambassadorial level in 1957. This wide-ranging cooperation came to a rather abrupt end in 1963, when Burma, under General Ne Win, embarked on a new policy of nationalization, self-reliance, and reemphasis on strict neutrality and noninvolvement with non-Burmese parties. Israel-Burma joint ventures wound down, though some Burmese students and professionals still came to Israel to study and a number of Israel experts went to Burma. Mutual trade also continued. In 1988, after the Burmese (Myanmar) armed forces (or Tatmadaw) formed the State Law and Order Restoration Council (SLORC) and took over control of the country, there were rumors of a secret military partnership between Israel and Burma. Low-level contacts in other spheres continued into the 21st century. During 2016 and 2017, the Myanmar military launched a brutal campaign against the country’s Rohingya minority. Many Rohingya fled to Myanmar’s neighbor Bangladesh. The Israeli Foreign Ministry established clandestine ties with Bangladesh, with which it has no formal relations, and attempted to coordinate delivery of aid packages for the Rohingya refugees. Bangladeshi officials rejected the offer however, citing potential political ramifications and regional sensitivities. It was reported that the Israeli government was selling weapons to Myanmar that were being used against the Rohingya while the Israeli Foreign Ministry was attempting to help the minority group. In October 2017, more than 300 Rabbis from across the United States signed a petition urging the Israeli government to halt weapons sales to Myanmar. Israel is believed to have ceased arms transfers around the same time. Charles Dunst, “Israel maintains warm ties with Myanmar by downplaying a human rights controversy,” JTA, (February 4, 2019).